The Twilight Saga not only caught the attention of readers all over the world, but had a huge impact in the media world as well. From novel series to movie series, this twisted fictional story of a forbidden love between a human girl, a hundred year-old vampire stuck forever as a teenage boy, and a love-struck wolf-boy, created more than just a splash in the box office. This Saga ignited the vampire craze that we still see today in movies and many other television series’ as well. There is a Twilight Saga FaceBook page that has over 45 million likes (31 of which are from my own friends list) and aside from fans choosing between Team Edward and Team Jacob, this FaceBook page exudes many different displays of the concepts and terms we have discussed in our two readings this past week. According to Henry Jenkins, “Most often, transmedia stories are based not on individual characters or specific plots but rather complex fictional worlds which can sustain multiple interrelated characters and their stories”, this is the idea of world-building. 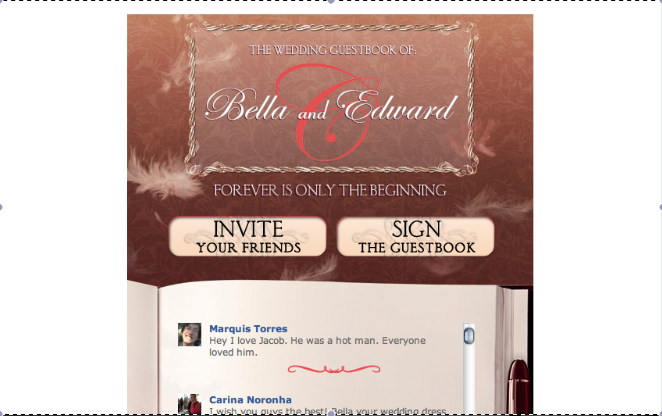 The Twilight FaceBook page encourages these complex fictional worlds in such a way that there is even a virtual Wedding Guestbook for Bella and Edwards ceremony where fans can sign it with their comments about the wedding and best regards to the happy couple. This type of World-Building also plays into what Janet Murray has to say about multiform stories, [which] “often reflect different points of view of the same event”. Seeing as fans are encouraged to ‘sign’ Bella and Edwards wedding Guestbook, they are each able to voice their own personal thoughts and ideas about the same event. Here is just one example from the FaceBook page that a fan wrote to the two love birds: “To Edward and Bella, I wanna say that your wedding was awesome and well designed and I think that Alice did an awesome job. Plus I wonder whose wedding she is going to be planning next. I am so excited to see more of her wedding planning. Oh and Edward I wanted you to marry me, instead of Bella”. Fans are able to act as if they are personal friends of these characters and talk to them as if they were really there at the wedding, which in turn allows multiple stories of that one event come, to life. Janet Murray also connects multiform stories concept with Cultural Attraction and Activation: “When the writer expands the story to include multiple possibilities, the reader [or viewer] assumes a more active role” The Twilight Saga does a great job of preserving Cultural Attraction and Activation through its Facebook page by promoting these multiple possible stories and continuously posts pictures and post status’ that gets the fans involved and keeps them actively drawn to the storyline and its characters. Murray, Janet H. “Chapter 2: Harbingers of the Holodeck.” Hamlet on the Holodeck. New York: Free, A Division of Simon and Schuster, 1997. 27-64. Print. The wiki page I chose to post about was on Miley Ray Cyrus. I chose this page purely because of the (negative and positive) media hype that has surrounded/followed this Hollywood start for the past several months. My main focus was not to necessarily find misinformed facts about the star and her life, but rather, the portrayal of her character due to her most recent (and past) actions. The results were pretty neutral as per Miley’s actions and my analysis ended up being mostly on the type of information being presented, who edits the page and how frequently it is worked on.The wiki page starts off with a very concise yet detailed synopsis of her career’s timeline. The article states her Name followed by the name she was born with, her birthday and her career title. According to IMBd in Google search, this information is all correct. The rest of the article continues on to break down her career path including her success being launched by the hit Disney Show Hannah Montana. In the ‘Talk’ Section of the wiki page, it mainly consists of edits on fixing grammatical errors to make sure that the information presented in the article sounds more intellectual. There is one discrepancy about the validity of a piece of information regarding the listing of her debut album but that is taken into consideration and is edited. The information (references) for this article has been retrieved from various sources starting from 2005-2013. The information being collected came from personal interviews from Miley as well as multiple highly revered newspapers/magazines and statistics about her albums’ success and rankings came mostly from ITunes and few other music websites/programs. The ‘collective intelligence’ theory applies to this article in the sense that all the information being stated has not come from just one source but from various sources (even outside of the US). The information came from the artist herself in personal interviews as well as from websites and programs that have measurable and mathematically recorded proof of her success and growth/changes in her career. The revison history shows that the article is constantly being critiqued and revised. The revisions date as recent as two days ago this month. There are quite a few edits that have the m next to it indicating that they were only minor and then there are a few edits requesting to add a new section to the page.